Here's a great page I discovered via Pat at Successful Teaching. It's Crayola's jazzy drawing tablet. Once you open the page, it's simple and intuitive to get started with your crayons, markers and brushes. You can choose different tools, colours, and tip sizes on the palette, then move away from the palette, left click and start drawing. The site allows you to print your efforts, but not save them, so I took a screen grab of my crazy creation seen at left. "But wait!" I hear you say. "What has this got to do with literacy?" It's been a while since I was a kid, but if I'd had this tablet available for practising writing words and learning spelling, I just know my enthusiasm would have been unbounded. I think children of any age will have fun with this. How about a decorated letter to a friend which they can print and send by snail mail? 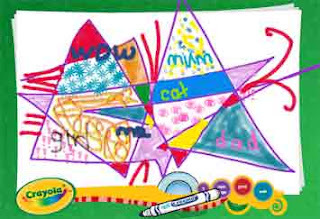 The main Crayola site has sections for parents, educators, and a ton of creative ideas for kids. It's well worth a look if you don't know it.